Ellertson was champion of the Hublot Gold Cup High Handicap after winning to UAE Polo final by 18-17 in extra chukker. 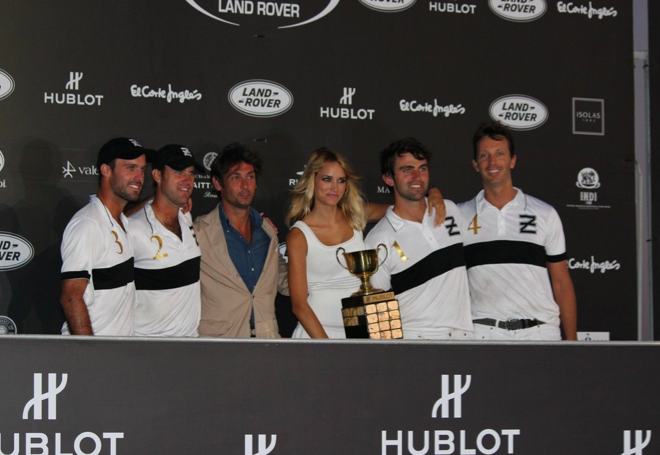 The team of Gonzalo and Facundo Pieres brothers; John Williams and Ali Paterson was the most important trophy of the season of the ‘42º Torneo Internacional Land Rover de Polo’. After a great game, one of the best finals of recent times, with good pole, two teams fighting until the last minute for the victory and plenty of excitement. The game was enjoyed by a lot of viewers, which filled the crowd of the main court of Los Pinos. A penalty, converted by Facundo Pieres from 30 yards in overtime, gave Ellerston the Gold Cup. The game started better for Ellertson, winners also of the Silver Cup, but UAE had a great reaction and went dominators of the match, thanks to excellent teamwork. UAE Polo Team came up on the scoreboard until three goal differences. When they face the Pieres brothers, never can be taken a match defined. And it was. Facundo Pieres, who had a season of record (champion in U.S., England and now Sotogrande) carried the team on his shoulders. He managed to tie the game, go to extra chukker and then instructed to give the winning goal, and the title, to Ellerston. The Duke of Alba, Sebastian Palomo Danko and Alba Carrillo were also present at the awards ceremony of the final that took place at Santa Maria Polo Club in Sotogrande.